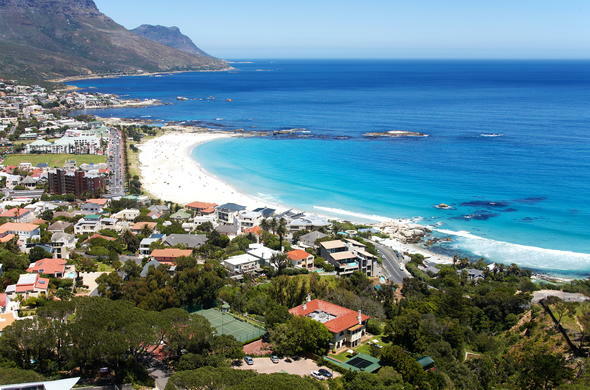 The hotel is located in the Glen area of Camps Bay, one of the most refreshing areas of travel destination, Cape Town. Camps Bay Retreat is built on a private nature reserve which borders Chilworth road, Victoria road and Table Mountain National Park. This Camps Bay hotel in Cape Town is within walking distance of Glen beach, Camps Bay beach and Clifton. It is about 7kms from the central business district, 10kms from the V and A Waterfront and 28kms from the Cape Town International Airport. Exit the Cape Town International Airport on the N2 to Cape Town. As you approach the city, follow the N2 City/Foreshore/Sea Point signage. You will eventually arrive at a large intersection with several sets of traffic lights (Coen Steytler Avenue). The Cape Town International Convention Centre will be on the left and the V and A Waterfront on the right. Proceed straight along this road (M62) following the Table Mountain Cable Way/Camps Bay signage. The road follows a steep and winding ascent to the top of the hill (Kloof Nek). Without turning towards the Cable Way, descend straight into Camps Bay. Take the second road to your right (Geneva drive) and follow its winding descent. Turn right into the fifth road, Sedgemoor road and go straight over a stop street (Berkley road). Turn right at the very next road to your right (Chilworth road). Your Camps Bay accommodation will be 100m down the road on the left. See other hotels in the area.